The Loyalist hosta is a beautiful option for gardeners who have a spot to fill in partial or full shade. 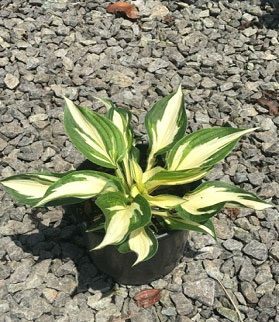 The Loyalist variety was bred from the Patriot hosta but has an interesting twist. Loyalist’s leaves have dark green edges and white centers, the reverse of Patriot’s. Loyalist is quite hardy, especially when it comes to wildlife. It’s resistant to both rabbits and deer, meaning your foliage will look great throughout the growing season. It also grows well in just about any type of soil, including the red clay found here in the York County area. Place Loyalist as an accent or border for your flower beds. And because of the sturdy nature of the leaves themselves, you can use the leaves in flower arrangements. The light lavender flowers appear from June to September and can also be used for cutting. The blooms draw in butterflies and hummingbirds, too, making this a great addition to the landscaping around your home. Loyalist grows to an approximate size of just over a foot tall and two feet wide. It does grow more slowly than other hostas, a trait shared by most varieties with white centers. Visit Rolling Hills Nursery & Landscaping to learn more or to pick up a few for your yard!